There are two types of cells on the basis of nucleus present within the cell. Prokaryotic cell type is called prokaryotes. Prokaryotic cell lacks membrane-bound organelles. The size range of prokaryotic cell is usually smaller than 3 micrometre. The genetic material of the prokaryotic cell is located in nuclear region or nucleoid. Nucleoid contains a single chromosome and a piece of circular double-stranded DNA. Further prokaryotic cells are divided into two types on basis of composition of cell wall into gram positive and gram negative cell. Here nuclear membrane, nucleolus, histone proteins are absent. Genes may be present in the cluster. The ribosome is of 70 S structure and evenly dispersed in the cytoplasm. Chloroplast, Golgi body, Mitochondria, Pinacocytes and endoplasmic reticulum is absent. Mesosomes and gas vacuole may be present in some prokaryotes. The cell wall of the prokaryotic cell is mainly composed of peptidoglycan, polysaccharides and glycoprotein molecules. It may show the presence of endospore in some prokaryotes. The respiratory system is located in the plasma membrane. The lysosome is absent in prokaryotes. It shows a wide variety of anaerobic energy-yielding mechanism. A prokaryotic cell has the ability to fix atmospheric nitrogen. It shows the presence of magnetosome. Protein synthesis is carried out in the cytoplasm. It may contain flagella, pili and capsule on its surface. A chromosome is circular in shape. Mitosis and Meiosis mechanism is absent in a prokaryotic cell. 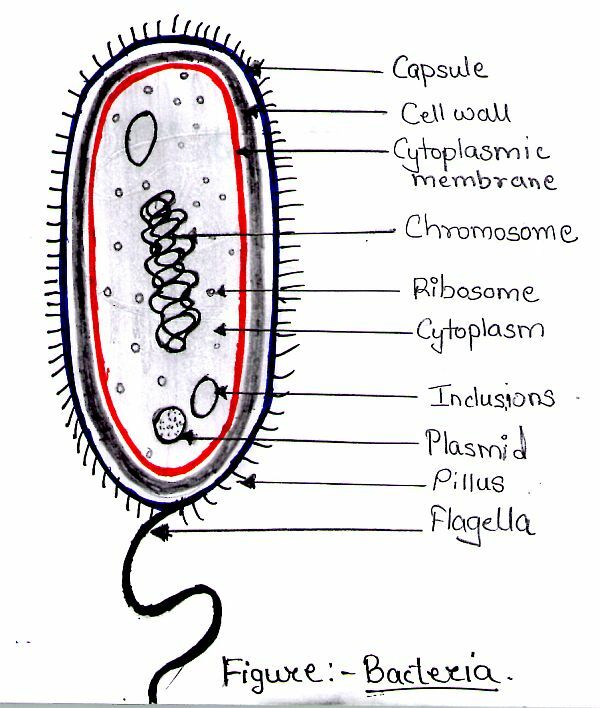 Reproduction of prokaryotic cell is carried out binary fission mechanism. Magnetogenesis is absent in these cells. Examples of prokaryotic cells are Bacteria, Cyanobacteria, Eubacteria, and Archaebacteria.